To download a printer friendly PDF version of this information click here. Mast, M.A., and Clow, David W., 2000, Environmental characteristics and water-quality of Hydrologic Benchmark Network stations in the Western United States, U.S. Geological Survey Circular 1173-D, 115 p.
All of the tables and figures are numbered as they appear in each circular. Use the navigation bar above to view the abstract, introduction and methods for the entire circular, as well as a map and list of all of the HBN sites. Use the table of contents below to view the information on this particular station. The South Twin River HBN Basin is in the Basin and Range physiographic province in the central part of Nevada (Figure 14. Map showing the study area in the South Twin River Basin and photograph showing the basin landscape). The topography of the area is characterized by north- to northeast-trending mountain ranges separated by long alluviated valleys. 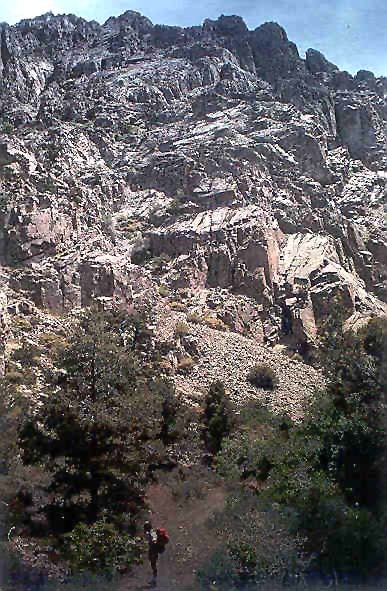 The South Twin River Basin is on the eastern side of the Toiyabe Range, which is cut by deeply incised drainages having spectacular cliffs and perennial streams (Brem and others, 1991). The basin drains 52 km² of rugged mountainous terrain and ranges in elevation from 1,951 m at the base of the Toiyabe Range to 3,588 m at the summit of Arc Dome. The HBN station is 24 km northwest of Round Mountain, Nev., at latitude 38°53'15'' and longitude 117°14'40''. The South Twin River is northeast flowing and has a channel length of 9.8 km upstream from the HBN station and an average stream gradient of 66 m/km. Downstream from the station, the river enters the Big Smoky Valley to the east where all but the highest flows are diverted into a concrete irrigation ditch. The channel upstream from the station is perennial, and mean monthly discharge varies from 0.064 m³/s in September to 0.70 m³/s in May during snowmelt. Average annual runoff from the basin was 11.4 cm during 1965 through 1995 (Bauer and others, 1996). Climate varies considerably with elevation but, in general, winters are long and summers are dry (Bailey and others, 1994). Average monthly air temperatures range from - 1.4°C to 22.2°C at elevations below 2,750 m and from -9.4° to 12.8°C at elevations above 2,750 m (Western Regional Climate Center, at URL http://www.wrcc.sage.dri.edu, accessed 1998). Average annual precipitation ranges from 20 cm in the valleys to as much as 75 cm at high elevations in the basin. More than 90 percent of precipitation falls as snow between October and May, accumulating in a seasonal snowpack that usually reaches 50 cm in depth. Intense thunderstorms are common in summer, especially in August, and can cause flash flooding. 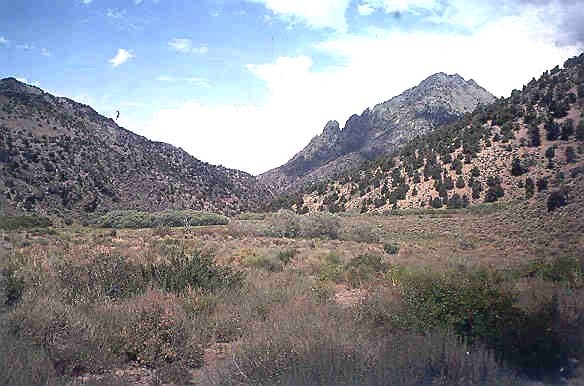 The basin is in the Nevada Mountains Semidesert ecoregion (Bailey and others, 1994). Slopes in the lower part of the basin are covered by a dense juniper-pinyon forest and have an understory of sagebrush that grades upward into mountain big sagebrush and curlleaf mountain mahogany communities above 2,650 m (U.S. Department of Agriculture, 1986b). Small stands of whitebark pine grow near the crest of the range on north-facing canyon walls. Vegetation along streams and around springs is dominated by cottonwood, quaking aspen, water birch, and willow. The mountain big sagebrush and the riparian communities have been degraded by past livestock grazing. The basin also contains large areas of rock outcrops that contain virtually no vegetation (U.S. Department of Agriculture, 1986b). Soils in the basin are classified as Cryoborolls and are in the Foxvire-Packer-Scuffe soil association (John Fisher, Natural Resources Conservation Service, written commun., 1998). This association consists of deep, well-drained loamy soils that formed in residuum and colluvium derived from volcanic rocks. A typical profile has a surface layer of brown gravelly loam that is 50 cm thick overlying a sublayer of light brown, stony to gravelly loam that extends to a depth of 150 cm. Soils in this association have pH values ranging from 6.4 to 7.2 and consist of 45 to 80 percent rock fragments. from a few centimeters to 3 m and generally consist of a matrix of quartz and carbonate minerals that include narrower ore zones of pyrite, gold, sphalerite, and galena. One mine site, referred to as the K claims, is located in the basin near the mouth of the South Fork of South Twin River. The mine site is in an area of high mineral potential, based on the study of Brem and others (1991), although it never produced more than small amounts of ore. The South Twin River drains the northwest part of Nye County and is in the Tonopah Ranger District of the Toiyabe National Forest. Most of the basin also is in the boundaries of the Arc Dome Wilderness, which was classified as a proposed Wilderness Area in 1979 and received Federal designation on December 12, 1989 (U.S. Department of Agriculture, 1990a). The wilderness is closed to all motorized vehicles and access in the basin is limited to a few foot trails that start from a gated road at the HBN station. Human activities in the basin are limited to dispersed recreational use, including hiking, horseback riding, and hunting. 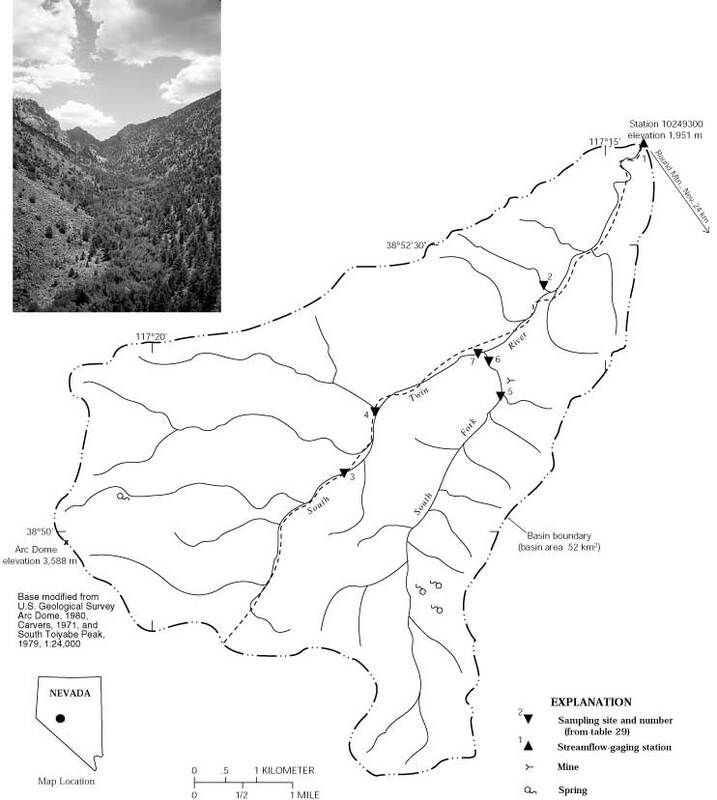 There are no developed recreational sites in the basin, although the trail paralleling the main stream channel is part of the Toiyabe Crest National Recreation Trail system that was constructed by the Civilian Conservation Corps in the 1930's. 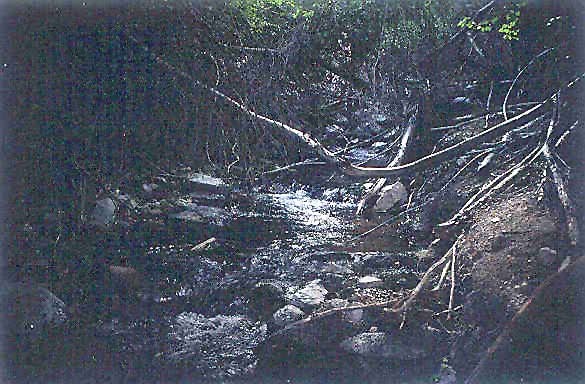 Until 1991, cattle grazing was allowed in the basin from June through October, which caused considerable damage to riparian areas, particularly along the upper reaches of South Twin River (Tonopah Ranger District, Toiyabe National Forest, oral commun., 1998). Although permitted grazing is no longer allowed, about 30 head of wild cattle occasionally graze in the headwater areas of the basin (Tonopah Ranger District, Toiyabe National Forest, oral commun., 1998). The abandoned mine site (K claims) near the mouth of the South Fork South Twin River contains three underground workings and their associated waste-rock piles. Water produced in the adit does not exit the mine as surface flow and probably is not a substantial source of metals and acidity to stream water because much of the mineralized rock in the mine contains carbonate-filled voids and veinlets (U.S. Department of Agriculture, 1990a). A plan of operation to resume mining at the K claims and to restore an access road was submitted to the Forest Service in 1988 (U.S. Department of Agriculture, 1990a); however, the mine did not prove to be viable and the request was never approved (Tonopah Ranger District, Toiyabe National Forest, oral commun., 1998). A record high runoff in 1983 caused minor damage at the mine site and the access road and scoured much of the main channel of the South Twin River (U.S. Department of Agriculture, 1990a). part of the period of record probably were analyzed at a USGS district laboratory in Sacramento, Calif. (Durum, 1978). After establishment of the central laboratory system, samples were analyzed at the Salt Lake City, Utah, laboratory from 1973 to 1975 and at the NWQL in Arvada, Colo., from 1976 to 1994. Daily discharge records for South Twin River (station 10249300) are available beginning in August 1965, and daily water temperature was measured at the station from April 1966 through September 1982. Calculated ion balances for 176 samples that have complete major-ion analyses are shown in figures 15a and 15b. Graphs showing temporal variation of discharge, field pH, major-ion concentrations, and ion balance in the South Twin River, Nevada. Ion balances ranged from -12 to +10 percent, and 95 percent of the samples had values within the ±5-percent range, indicating that the analytical results are of high quality. The average ion balance was -0.4 percent, indicating that unmeasured constituents, such as organic anions, are not an important component of stream water at this station. Time-series plots of the major dissolved constituents were inspected for evidence of method-related effects (fig. 15). Field pH values decreased somewhat abruptly at the beginning of 1973, which may have been caused by a change in measurement method or instrumentation used by field personnel. A similar shift in field pH also was observed at Steptoe Creek, another HBN station in Nevada, providing additional evidence that the pattern is probably an analytical artifact. The stepped pattern in the concentrations of nitrite plus nitrate was caused by changes in the analytical reporting limit for this constituent that occurred in 1982 and again in 1991.
a Values are volume-weighted mean concentrations for 1985-95.
moderately concentrated and well buffered; specific conductance ranged from 72 to 160 mS/cm, and alkalinity ranged from 580 to 1,500 meq/L (table 26). The major cation in stream water was calcium, and the major anion was bicarbonate. The high calcium to sodium ratio in stream water and the high concentrations of alkalinity indicate that most of the solute load in the stream is probably derived from weathering of carbonate minerals associated with mineralization rather than from dissolution of sodium- rich feldspars in the unaltered volcanic rocks. The median chloride concentration in stream water was 51 meq/L and was substantially greater than the VWM concentration of 2.8 meq/L in precipitation, indicating that most chloride is derived from sources other than precipitation. Because land use in the basin is minimal and the bedrock probably does not contain appreciable amounts of chloride, the most likely source of additional stream-water chloride may be wind-blown material derived from arid valleys to the west and east of the Toiyabe Range. The median concentration of sulfate in stream water (120 meq/L) also was substantially greater than the VWM concentration of 8.2 meq/L in precipitation. Although some stream-water sulfate may be derived from wind-blown dust, most is probably contributed by oxidation of pyrite in mineralized bedrock. Concentrations of inorganic nitrogen species in stream water were less than the average concentration in precipitation, indicating that most atmospheric nitrogen is retained by vegetation and soils in the basin. Low stream-water concentrations of nitrogen species also indicate that cattle grazing in the basin has not substantially affected nutrient concentrations at the HBN station. The solute composition of stream water was further evaluated by analyzing correlations between solutes and stream discharge (table 27). Most weathering-derived constituents were negatively correlated with stream discharge, which is consistent with a hydrologic system where weathering-enriched base flow is diluted by water from shallow or surficial sources during periods of increased discharge, particularly spring snowmelt. For the solutes, the strongest correlations were found among calcium, magnesium, and alkalinity (0.773 < rho < 0.874), which is consistent with the weathering stoichiometry of carbonate minerals. The poor correlation between sodium and silica (rho = 0.043) was unexpected because feldspar minerals in the volcanic rocks should be the major source of sodium and silica. Sulfate was positively correlated with calcium (rho = 0.625) and magnesium (rho = 0.633), perhaps reflecting the presence of pyrite and carbonate minerals in mineralized veins. a Trend calculated for 1971-95 using a trend test for censored data. The results of the seasonal Kendall test for trends in discharge and major dissolved constituents are listed in table 28. A statistically significant trend was detected only in potassium concentrations at the 0.01 probability level. The magnitude and probability of the trend were similar for the unadjusted and flow-adjusted concentrations, indicating that the potassium trend was not caused by variations in stream discharge. The absence of trends in the major solutes was not unexpected because the basin is in a wilderness area and has had little land use, except grazing. The cause of the downward trend in potassium concentrations could not be identified. The LOWESS curve in figure 15 shows that potassium concentrations were fairly constant during the early part of the period of record and then declined gradually after 1984. The decrease in potassium probably was not an analytical artifact because the samples were analyzed at the NWQL since 1976 using a single technique. Environmental factors that may have affected stream-water potassium concentrations included livestock grazing and atmospheric deposition. The effect of cattle grazing on stream-water potassium concentrations is not known; however, grazing pressure in riparian areas has been substantially decreased since the establishment of the wilderness in 1979. Lynch and others (1995) reported declines in base-cation concentrations, including potassium, at several NADP stations in the southwestern part of the United States between 1980 and 1992. Although the trend in precipitation chemistry is consistent with the decline in stream-water potassium, confirmation of the linkage between precipitation and stream chemistry is difficult because no precipitation stations are located in or near the South Twin River Basin. Results of the surface-water synoptic sampling of July 23-24, 1991, are presented in table 29, and locations of sampling sites are shown in figure 14. During the synoptic sampling, discharge at the HBN station was 0.082 m³/s compared to the median daily discharge of 0.12 m³/s for July and 0.07 m³/s for August (Lawrence, 1987), indicating that the basin was sampled under normal flow conditions for that time of year. Most of the solute concentrations measured at the HBN station (site 1) during the synoptic sampling were less than the first-quartile values reported for the station during the entire period of record, except for sodium and silica concentrations, which were higher (table 26). Water in the tributary streams were similar in composition to stream water at site 1, with calcium and bicarbonate the predominant solutes. Ion balances for the synoptic samples averaged 0.1 percent (ranging from -2.7 to 4.9 percent), indicating that unmeasured ions, such as organic anions, probably were not an important component of stream water during the synoptic sampling. Concentrations of the weathering-derived solutes did not vary markedly among the sampling sites, probably because of the small basin size and the relatively uniform composition of the bedrock. For example, calcium ranged from 360 to 900 meq/L, and alkalinity ranged from 620 to 1,180 meq/L (table 29). Silica was remarkably constant, varying only from 330 to 350 mmol/L. Sulfate concentrations also were fairly uniform and relatively low (average about 70 meq/L), particularly considering the presence of several mineralized zones in the basin. 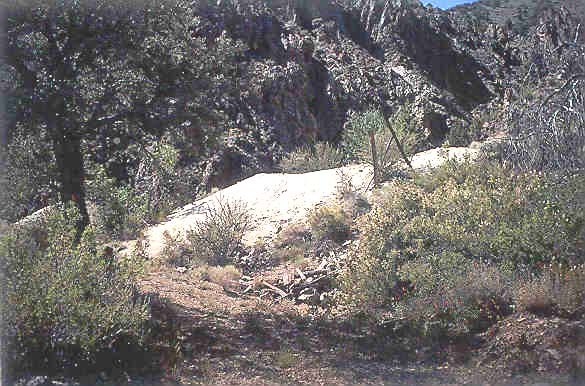 Site 4, which drains a weakly mineralized area on a southeast-facing slope, had the highest sulfate concentration. The high chloride concentration and southerly aspect of this site, however, may indicate that the high sulfate concentration is due to evapotranspiration rather than weathering of sulfides. The abandoned mine site did not seem to affect stream chemistry during the synoptic sampling, as evidenced by the similar stream chemistry upstream (site 5) and downstream from the mine (site 6). However, because the waste-rock piles at the mine site are located near the stream, they may have a disproportionate effect on stream-water chemistry during spring snowmelt or summer thundershowers when direct runoff is more likely to enter the stream. Nitrate concentrations were extremely low at all sampling sites (<3.6 meq/L), which is consistent with the minimal amount of land use in the basin. a Criteria used in selection of sampling sites: BG = bedrock geology, MT = major tributary, LU = land use. Bailey, R.G., Avers, P.E., King, T., McNab, W.H., eds., 1994, Ecoregions and subregions of the United States with supplementary table of map unit descriptions: Washington, D.C., U.S. Department of Agriculture, Forest Service, scale 1:7,500,000. Bauer, D.J., Foster, B.J., Joyner, J.D., and Swanson, R.A., 1996, Water resources data, Nevada, water year 1995: U.S. Geological Survey Water-Data Report NV-95-1, 734 p.
Brem, G.F., John, D.A., Nash, J.T., Poole, F.G., and Snyder, D.B., 1991, Mineral resources of the Arc Dome Wilderness Recommendation Area, Nye County, Nevada: U.S. Geological Survey Bulletin 1961, 21 p.
Durum, W.H., 1978, Historical profile of quality of water laboratories and activities, 1879-1973: U.S. Geological Survey Open-File Report 78-432, 235 p.
Lawrence, C.L., 1987, Streamflow characteristics at hydrologic benchmark stations: U.S. Geological Survey Circular 941, 123 p.
Lynch, J.A., Grimm, J.W., and Bowersox, V.C., 1995, Trends in precipitation chemistry in the United States-A national perspective, 1980-1992: Atmospheric Environment, v. 29, no. 11, p. 1231-1246. U.S. Department of Agriculture, 1986b, Land and resource management plan, final environmental impact statement, Toiyabe National Forest: Ogden, Utah, U.S. Department of Agriculture Forest Service, Intermountain Region. U.S. Department of Agriculture, 1990a, Final environmental impact statement for the South Twin Load mining and development proposal, Nye County, Nevada: Ogden, Utah, U.S. Department of Agriculture Forest Service, Intermountain Region. Brem, G.F., John, D.A., Nash, J.T., Poole, F.G., and Snyder, D.B., 1991, Mineral resources of the Arc Dome Wilderness Recommendation Area, Nye County, Nevada: U.S. Geological Survey Bulletin 1961, 21 p., scale 1:63,360. Whitebread, D.H., 1988, Preliminary geologic map of the eastern half of the Ione quadrangle, Nye County, Nevada: U.S. Geological Survey Open-File Report 88-48, scale 1:62,500. Vitaliano, C.J., 1963, Cenozoic geology and sections of the Ione quadrangle, Nye County, Nevada: U.S. Geological Survey Miscellaneous Field Studies Map MF-255, scale 1:100,000. U.S. Department of Agriculture, 1987, Toiyabe National Forest, Tonopah Ranger District: Ogden, Utah, U.S. Department of Agriculture Forest Service, scale 1:126,720. Table B-1. NWIS site-identification numbers and site names for water-quality sampling sites. This page maintained by Nichole Bisceglia. Last updated August 3, 2000.